August 25, 2014 – Top time-triallist Fergal May surpassed all expectations last weekend when taking 12 points from the Stafford Wholesale Wexford Two Day in Camaross. On a hilly, warm stage one, which took many by surprise, May worked hard in the A3 race to land seventh behind Dublin University’s Brendan Murphy, rolling over the line a nose ahead of old adversary Noel O’Dwyer – the Comeragh CC rider who pipped him on countback alone for the A4 yellow jersey at Kanturk’s three-day in May. 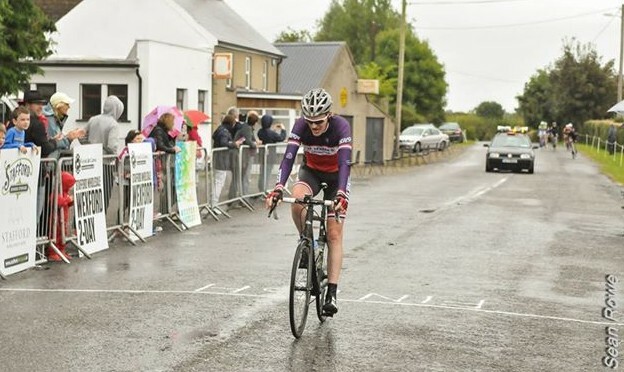 After the evening’s hill climb time-trial, May was level with team mate John McGettigan in the general classification and took aim at a stage win on Sunday on an easier circuit out to New Ross and back to race HQ at Camaross. He made one big move, getting into the winning break late on and, though unable to hold on to first and second Declan Kinch and Liam Cullen in the run-in, grabbed third, 10 seconds of the winners. The performance put him 13th in general classification and sees him go to Charleville’s two-day with an upgrade to A2 on the cards. He said: “I’m in shock that I placed in both road stages. Stage one was very tough and I blew on the last steep climb, (cramps) but still held off the bunch. Sunday’s stage was easier, but my legs were mangled. “I wasn’t sure at one point if I’d finish the stage. I attacked at the exact same point as yesterday, bridged to the two leaders but had nothing left for the finish. McGettigan finished 28th in general classification, 1’58” off winner Brendan Murphy, while Martin Caddow was a further minute back in 49th. Martin Vereker watched the final stage from the cavalcade after ploughing through the first two stages despite illness. In A4, it was a weekend to forget for Dermot Doherty with a plethora of race-ending punctures, but James Kelly rode solidly to land 15th in general classification. In the elite race, Eamon Peregrine battled through Saturday’s road stage before recording an 8’30” time-trial. It was his first – and last – stage race of the year and Vereker said: “Eamon did a good hill climb and hung tough today in the bunch. I had the pleasure of watching the agony from the Orwell team car. He’s going well. No Replies to "Douze points for May at Wexford Two Day"